The four-year integrative curriculum of the Department has been designed with an understanding that it gives opportunities to students to evaluate the built environment, design, and build in modern project studios. The department offers a flexible and frequently updated timetable which enables the students to take elective courses from different departments as well as their own department. The main focus of the educational approach is on the architectural design studio augmented by professional theory courses. The interactive studio, as the proper arena for critical thinking, provides a milieu for addressing social, technical and environmental issues around an architectural project, through the re-creation and discussion of the spatial dimension of the built environment. The department continuously pursues opportunities for national and international accreditation and has been granted MIAK (Architecture Accreditation Board) accreditation for six years. Being the 4th program which has successfully gained international accreditation over 60 architecture programs both in Northern Cyprus and throughout Turkey, Eastern Mediterranean University Architecture program takes pride in being the one and only program among foundation universities which has received international accreditation for a period of six years. The department is currently working on further projects for the international accreditation of RIBA (Royal Institute of British Architects) and NAAB (The National Architectural Accrediting Board). Department of Architecture offers a learning environment with a contemporary approach to education for young people of diverse cultural backgrounds. The aim is to provide opportunities for future architects to be equipped with necessary knowledge and skills to cope with rapid global changes, to react rationally as well as creatively to contemporary issues in architecture, its problems and challenges, within an interdisciplinary approach to education through its distinguished academic infrastructure. The graduates are expected to contribute to the improvement of quality of life as dynamic individuals with a high sense of responsibility and leadership, capable of assuming central roles in teamwork - a global reality of our day. EMU’s Main Library houses a wide collection of books and periodicals related to art and architecture. The Department also maintains a special library containing a wide range of architectural periodicals and books. There are three well-equipped CAD labs and a material, an environment, a model and photography laboratories at the students’ service. Additionally, Design and Research Center (TASAR), Urban Research and Development Center (Kent-AG) and Housing Education Research and Advisory Center (HERA-C) are among the educational and research facilities which the students make use of. Graduates of the Department of Architecture who have the privilege of being a graduate of an institution with EAAE membership find opportunities for work in public or private institutions, or work as freelance architects. Some get into the type of work concerning a wide range of functions from designing shop-windows or fair stands, to more implementation oriented work in construction firms. 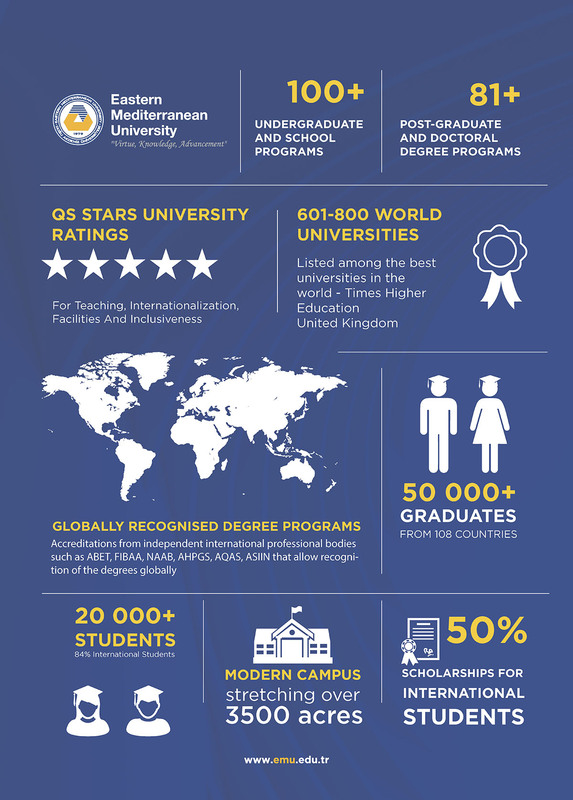 Others take up post-graduate studies either at EMU and universities in Turkey, or other universities in Europe or the U.S.A. and pursue academic work successfully. Basic principles of design, creating a visual vocabulary through 2 and 3 dimensional exercises, design elements and their characteristics, design principles, problems to enhance students’ mental and manual skills, emphasis on creativity, and critical thinking. The basic tools of graphic communication, principles of orthographic, axonometric and perspective drawing, introduction to different graphic presentation methods. Development of a conceptual background for design by introducing inclusive definitions of design, its basic vocabulary, elements, principles, organizational aspects and design process. ENGL191 is a first-semester freshman academic English course. It is designed to help students improve the level of their English to B1+ level, as specified in the Common European Framework of Reference for Languages. The course connects critical thinking with language skills and incorporates learning technologies such as IQ Online. The purpose of the course is to consolidate students’ knowledge and awareness of academic discourse, language structures, and lexis. The main focus will be on the development of productive (writing and speaking) and receptive (reading) skills in academic settings. ENGL 181 is a first-semester freshman academic English course. It is designed to help students improve the level of their English to B1+ level, as specified in the Common European Framework of Reference for Languages. The course connects critical thinking with language skills and incorporates learning technologies such as IQ Online. The purpose of the course is to consolidate students’ knowledge and awareness of academic discourse, language structures, and lexis. The main focus will be on the development of productive (writing and speaking) and receptive (reading) skills in academic settings. Algebraic expressions, equations and inequalities. Relations and functions, Quadratic functions. Trigonometric functions, trigonometric identities and equations, applications of trigonometry. Vectors and their applications, polar equations. Matrices and determinants, solution of linear system of equations. Analytic geometry; parabolas, ellipses, hyperbolas, conic sections, quadratic surfaces. This course puts an emphasis on design process, exercises on three dimensional forms, space, function, material, structure, r ole of context, human dimension and scale, transition from abstract problems to concrete ones. Advanced graphic communication techniques, developed techniques of 3-D drawing, drawing conventions in different design branches, presentation techniques in various drawing media. Integration of design thinking with the appropriate structure and technology; history of design technology, structural logic, form, structure and material, sustainable and innovative aspects of design technology. ENGL182 is a second-semester freshman academic English course. It is designed to help students improve the level of their English to B2 level, as specified in the Common European Framework of Reference for Languages (CEFR). The course connects critical thinking with language skills and incorporates learning technologies such as IQ Online. The purpose of the course is to consolidate students’ knowledge and awareness of academic discourse, language structures, and lexis. The main focus will be on the development of productive (writing and speaking) and receptive (reading) skills in academic settings. ENGL192 is a second-semester freshman academic English course. It is designed to help students improve the level of their English to B2 level, as specified in the Common European Framework of Reference for Languages. The course connects critical thinking with language skills and incorporates learning technologies such as IQ Online. The purpose of the course is to consolidate students’ knowledge and awareness of academic discourse, language structures, and lexis. The main focus will be on the development of productive (writing and speaking) and receptive (reading) skills in academic settings. This course is an introduction to the world of Computing and Information Technology (IT). Today, we are all part of an exploding Information Society and in this dynamic new society people at homes, schools, institutions and businesses are engaged in an ever- growing partnership with computers. Computers and Information Technology are part of just about everything we do at work and at home. And the fact is that, computers will play an even greater role in our lives in the years to come. The course presents the basic description of information technology concepts, basic computer system hardware and software components, common terminology in information technology, application areas, and integration of computer system components. A survey of relations between the human being as the primary determinant in shaping the built environment, social functions, cultural factors and architectural design. Introducing ergonomics and anthropometrics: Human scale, dimensions and activities of th e human being and association of these factors with design. Key issue of social and cultural life: interaction between individuals from various user groups in reference to private, public, semi-private and semi-public spaces at home, school or workplace; in and around other buildings; and urban spaces. Culture and human behavior: Cultural differences in human interaction based on a complex set of hierarchies, social n orms, behavior, translated into the design solutions. Examining the implication of social matters in various settings and their relationship with the place via case studies. Emphasis on creating an awareness of designing and articulating spaces with human factors as reference. A studio course designed to develop an understanding of form, function and space relations through projects of limited complexity. Minimum structural input not to limit the creativity of students. Emphasis on the overall architectural design process including site, literature survey, functional diagrams and program concepts, human and social factors ergonomics. The core course promises to be an important component in paving the path towards environmentally sensitive architecture education with the purpose of providing architecture students with a sensitivity and understanding of the natural processes that shape our s ocial, cultural and natural environment. The course focuses on basic ecological design principles and concepts at two scales - the small scale site/building and the larger scale comprising the development of an urban quarter or cluster, and exposes the students to both conventional and the latest technological knowledge available. Key issues/concepts to be explored within the course include: the primary reasons and arguments for the rapidly expanding ecological design movement (with references to population, community, ecosystem, natural environment, densi ty and context), sustainable architecture and its various dimensions (design with climate, nature, material, community, new technology, etc. ), traditional architecture and urbanism, regional architecture, design with ecology and technology, case studies in contemporary regional/ecological design. First in the series of survey courses on history of world architecture and art, covering the period f rom pre-historic times to the end of the medieval era, specially designed for Architecture students. Focus, on the theoretical perspective as well as the historical. First part of the course deals with the evolution of architecture and art from prehistory until the end of the pagan world; the second, with architecture developed in the West and the East with the rise of religions-Christianity and Islam- until the end of medieval times. Due to comparative nature of the course, a rather broad geographical scope is considered to include topics and examples from Europe, Asia and Africa. Architecture of Egypt, Greece, Rome, Early Christianity, Early Islamic, Byzantine, Romanesque, Gothic, Safevid, Seljuk, Mongol, and Early Ottoman architecture are taken up in a chronological line. All major themes and genres of architecture and art to be covered: religious and secular architecture, decorative arts, and traditional arts like calligraphy in their relationships to Architecture and desig n.
A course aiming at the exploration of a concept regarding the investigation of architectural meaning of structures. Study of basic terminology and classification of structural systems in relation to the concept of tectonics in architecture. Tectonics of all form-resistant structures, flexural and masonry structures via one successful case study for each system. Resultant forces in two dimensions, basic concepts of equilibrium, center of gravity, and moment of inertia along with structural requirements suc h as stability, strength and equilibrium, discussed on specific cases. Structural behavior, regulations, methods of construction and tectonics of masonry structures studied in detail. Histo ry of structures, philosophical concepts about the process of architectural and engineering design of building structures. Concepts of objectivity, abstraction, modeling, analysis and optimization in relation to different economic approaches to structures in architecture; structural ef ficiency, optimization of design, design of the optimum, and design of symbolic capital. Aesthetics and ethics of structural design in relation to economy and structural requirements of buildings. Tectonics of buildings, which have all types of masonry (brick, stone, timber; with or without tie beams) and some basic types of skeletal structures, and their construction characteristics. All possible construction methods of these structures; infill wall possib ilities and their construction methods; construction of possible cladding systems, which are used with these systems; some examples of finishing which are used in these types of buildings. A course introducing students to the principles of CAD, the theories and methods on which it is founded, and its principal applications in practice - generating, evaluating, modeling, drafting, and rendering design solutions. Surveying and Technical Field Trip: The students of the Department of Architecture should have training beside their architectural credit courses for their graduation. Therefore, the department of Architecture, at certain times of the year independently or together with other departments, organizes technical trips/workshops or approves their arrangement. Duration of ARCH 190 should be a minimum of 10 days for leveling and survey, and maximum 10 days for workshop and/or technical trip. Workshop or technical trip could be done within two short periods also (including semester break in fall period). In order to be successful, students should pass from both leveling and survey + workshop or technical trip. Minimum 17 working days. A studio course designed to develop an understanding of form, function and space relations through projects of fairly complex functions: A minimum of two-story buildings with simple structures in built environment. Emphasis on site and the immediate environment, sloped topography, orientation and other climatic factors, s ocial factors, appropriate construction techniques, materials, details- roof, stairs, and other building components. Second one of the survey courses on the history and theories of architecture, designed in three phases. The first dealing with the evolution of architecture and art in Europe and Asia from rise of Renaissance just after the fall of Constantinople and until the 17th century, the second covering the developments in architecture during the 18th and 19th centuries in Europe and in the eastern world, and the third starting with the 19th century Industrial Revolution, covering contemporary architecture until the end of 20th century and the art of Europe and America. A rather broad geographical scope with topics including examples from European, Asian, African, American and Australian continents. A chronological line beginning from the end of the medieval times to architecture of Renaissance, Baroque, Islamic architecture e.g. Classic Ottoman Art, Westernization of the Islamic Art and classicism, Art Nouveau, Modernism, Post-modernism and recent trends in architecture. All major themes and genres of architecture and art to be covered: religious and secular architecture, decorative arts, and tradi tional arts like calligraphy in their relationships to Architecture. A course covering the relationship between structural behavior, form, methods of construction, and tectonics for flexural structures, via successful case studies. History of supports and joints in architecture, three equations of equilibrium, types of stresses and internal forces in relation to deflected shape and with the help of models. Approximate analysis and design of existing trusses and simple frames paralleling discussions of tectonics of their details. Earthquake resistant architectural design in relation to the architectural requirement of change in infill walls. Slabs, structures of large non-load bearing surfaces, and suspended surfaces with the help of case studies. Logic behind portal and cantilever methods, high-rise building structures and their space characteristics. The goal of this course is to provide students with the knowledge and skills required for wide span roof structures (folded plate, space frame, membranes, dome, truss systems etc. ), stairs, windows, doors with their own detailing. All kinds of possible con struction methods with their special finishing details will be dealt. A course to study the environmental factors influencing architectural design. Issues of climate, lighting and acoustics in relation to energy problems and user comfort. Climatic elements, classification of climates for architectural purposes, thermal process of human body, thermal comfort indexes, thermal process of buildings. Various climate control methods in buildings: thermal, solar, condensation, wi nd control and natural ventilation. An introductory course on the basic understanding of urban design issues, in general and within a historic perspective. The course aims to introduce the theories and methods of urban design as a discipline integrated with architecture. The topics of the lectures and discussions: concept of urban space, visual variables determining the quality of urban space, unity as the basic element of urban design, permeability, variety and legibility as main principles of urban design determining the quality of public realm. The course provides students with an introductory yet comprehensive overview of urban design theory and the work of leading urban design theorists encompassing its visual, perceptual and environmental dimensions. A studio course designed to provide the student with skills of designing in urban context considering various urban problems. The emphasis on the design concept at a larger scale with particular attention paid on achieving unity within the urban environment. Sensitivity to the existing context by means of historic environment is essential. Requirements include a quality of design, social factors, quality and hierarchy of open and semi-open spaces, street furniture and landscaping, orientation and organizati on of buildings on site, public-private interface, vehicular and pedestrian circulation, climatic considerations, appropriate construction systems and materials, and regulations. A course aiming to provide the students of architecture with basic knowledge and understanding of architectural and cultural heritage. Presentation of appropriate concepts of basic conservation, historic preservation and restoration to help students acquire skills to apply in practice. Emphasis on creating awareness and stirring up interest in architectural and urban heritage, supplying an overview of the concept of architectural and urban conservation, searching answers for questions: what should be preserved, why, for whom, and how. The topics include cultural heritage, measured drawing techniques; concepts of conservation, preservation, revitalization, restoration; restorat ion techniques. A course covering the relationship between structural behavior, form, methods of construction, and tectonics for form- resistant structures, via successful case studies. The relation between internal forces, form, and tectonics. Strength and deformation of members in compression and tension, and problems of buckling and wind instability on existing examples, in relation to the effect of solutions to th e tectonics of the building. Internal forces in form- resistant structures using physical mod els and approximate analysis of existing structures. Standards and regulations and their effects on tectonics of architecture. Industrialized and prefabricated building techniques (Tunnel formwork, skeleton, panel, modular construction systems), building envelopes (structural, nonstructural facades, classification of facades according to the materials) and their construction characterist ics. All possible construction methods of these structures and some constructed examples of these types of buildings in detail. The course draws on the extensive theoretical foundation of urban design as a means to explore approaches to appraise the character of the built environment, and, as a result, to forward practical proposals aimed at beneficially influencing the overall quality and livability of urban environments. Knowledge is firstly imparted through a series of lectures, then developed through the undertaking of project work designed to ensure the application of theory to practice. The aim of this course is to produce architectural projects as complete as possible from concept to final 3D presentation models, which are 3-D building (BIM/Revit) models that are effectively rendered and situated in a context that is landscaped and designed with appropriate form, structure, materials and objects such as cars, people, etc. Rendering involves the convincing use of materials, lights, background and other rendered effects, with the aid of other software than BIM modelers such as Photoshop and/or 3DS Max, when appropriate. Construction Site: Practice at certain construction site(s) must be verified and reported through consistent documenting, photocopy, and daily activity reports. The department standard training report book must be filled up properly and signed by the official site manager of the construction site(s). Duration of ARCH 290 should be 25 working days. A studio course designed to provide the students with necessary skills to design multi -storey and multipurpose building complex in built-up areas with high complexity in functional organizations; integration of appropriate structural and environmental control systems, materials, building codes and regulations in the metropolitan scale urban context. The emphasis on designing a mixed-use complex is important in considering the themes; repetition, reproduction, variation. A third survey course in history dealing with various aspects of the history of architecture not covered in the two previous courses because of the chronological approach. Depending on the choice of individual tutors, topics are covered by typological approaches, an alytical studies, as symbolism in architecture, etc. Emphasis on theoretical aspects of architecture: ideologies, philosophy of art and architecture, contemporary theories, concepts and practices of periods after modernism. The elective courses offered this semester are listed below. For a complete list of elective courses, please check the department website. The purpose of this course is to provide students with the ability to produce working drawings (two-dimensional) with the aid of computer. In this course, students will get familiar with the legislation and working drawing system for the pr ofessional use. Lectures and exercises will be to introduce students to the systematics of drawing a project that could be realized in the real world. This meaning; the project would withhold enough information to be interpreted by contractor or any other person who is involved in realization to be able to read it. A course aiming to study all kinds of sanitary and environmental systems in buildings and their approximate size prediction. Issues to be covered: Water supply, hot water, liquid waste, solid waste systems and sanitary appliances; energy systems (electrical syste ms, telephone ducts, gas-liquid and solid fuels), heating, cooling, ventilating, air conditioning systems, smoke and ventilation flues, refuse chutes; mechanical conveyors-lifts, escalators, tube conveyors -, fire systems -alarms and firefighting equipment-, lightning protection; security systems. A studio course designed to provide the student with skills of designing long span structures by considering integrated construction and service systems. The main emphasis is to design buildings with high complexity in function with appropriate structural systems and creating rich architectonic qualities. A course consisting of basic concepts and definitions for: construction management, principles of engineering economy, cost/benefit analysis, break-even analysis, interest calculations, and economic comparison. Parties and stages of construction projects, engineering site organization, construction contracts and their documents. Types of specifications. Project planning techniques, bar chart, network analysis, arrow diagram. Architectural Office: students are expected to contribute to the design and/or technical drawings of the application projects (house, shop, office, restaurant... etc.) of a single project or several projects lead by the institution that the student is practicing with. Students are expected to present documentation for all their studies and contribution in the institution. Students have to complete a minimum of 25 working days as office practice. A final studio course in which students are expected to develop their designs independently. They are expected to work from macro to micro scales and with special emphasis on the individual interest areas. Each student is to demonstrate individually a performance that he/she has attained the professional standard required to practice within the rich context of the architectural discipline. Preparation Professional practices, responsibilities, ethics, relationship with other members of trade are basic concerns of this course. Analysis and preparation of accurate estimates of probable construction costs with emphasis on construction and finishes, writing specifications, the bidding process, contracts and letters of agreement and the preparation of bid documents will be addressed. Management concerns include the evaluation of construction time and cost, contract management, construction documents, inspections, time scheduling and control.